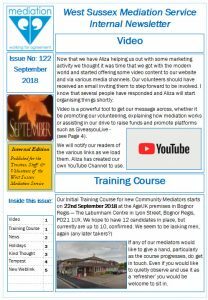 Time again for one of our monthly newsletters. With some diary dates fast approaching we din’t want to publish it any later in the month. We are happy to help publicise the launch of a new short film on Mediation, entitled ‘Tempest’, which has been commissioned by our neighbour service in Brighton (BHIMS).It has its official launch on Thursday 11th October at the Sallis Benney Theatre in Brighton. Click here or on the image below to view and read the newsletter. Remember you can get our newsfeed very easily by subscribing at the very bottom of this page on our website.